The idea that the ratio between ocean and land areas and their mutual locations play a role in climate formation that is no less than that played by the latitudinal zonality of insolation and the composition of atmospheric gases is repeated so often that it has taken on the appearance of a belief. But no idea (even those constantly repeated) can be considered as being correct until it has been corroborated by proof. Such proof can be obtained when using either empirical data or the results of specially planned numerical experiments. In this discussion of the results of numerical experiments we start with an answer to the question as to what climate of the Earth would have had if it had been covered solely by ocean or by land. At first sight this question may seem senseless. 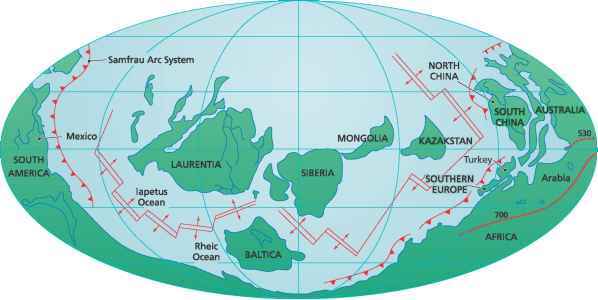 But let us not jump to conclusions and recall instead that in the course of the Earth's geological history the ratio between ocean and land areas in separate hemispheres has been subjected to repeated and quite significant changes generated by the drift of continents. These changes, on a time scale of the order of 108 years, must have been accompanied by climate fluctuations characterized by the weakening or enhancement of continentality. Thus, the simulation of climate with the two above-mentioned limiting situations allows us to estimate the probable range of climatic fluctuations caused by the drift of continents and, thereby, helps us to solve the problem of the reconstruction of the paleoclimate. The purpose of the numerical experiments carried out by Kagan et al. (1990) can be interpreted in this way. The 0.5-dimensional (box) model of the climatic system of the Northern Hemisphere, described in detail in Section 5.5, was taken as the basis for the above-mentioned work. It was initially modified in two respects. First, in the case of the ocean-covered Earth, in the equations of conservation of heat for temperate and low latitude areas the correlative term was excluded, i.e. 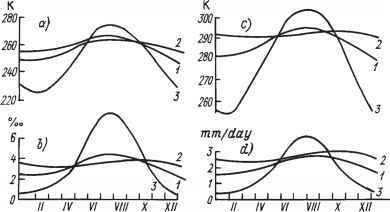 the influence of spatial inhomogeneity of the fields of temperature and thickness of the UML being determined, among other things, by the blocking effect of continents was not taken into account. Second, in the case of the land-covered Earth the soil moisture content was fixed, W¡WC was assumed equal to 1, and the southern boundary of the snow cover was identified with the annual mean isotherm — 1 °C, which position, as in the initial model, was found by approximation of the meridional distribution of the annual mean surface air temperature by the first two terms of the series in even Legendre polynomials. The results of the numerical experiments presented by Kagan et al. (1990) demonstrate that the ocean-covered Earth had a warmer climate, and the land-covered Earth had a colder climate (compared to the present climate), with the main differences of climatic characteristics being confined primarily to high latitudes: the difference of the annual mean values of surface air temperature in the two cases mentioned accounted for more than 26 K in the northern box and only 3 K in the southern box. The causes of such climate transformations are obvious. They are: changes in the radiative and thermophysical properties of the underlying surface and the existence of positive feedback between the albedo of the underlying surface and surface air temperature, from which two most remarkable features of the solutions obtained take their origin: the disappearance of sea ice in the first case and a considerable displacement of the snow cover towards the south in the second case. But the matter is not restricted to the above. In the case of the ocean-covered Earth the temperature of the deep layer in the temperate and low latitude areas is to by more than 12 °C with respect to present-day values. This feature is caused by a weakening of the transport of cold deep water from high latitudes to temperate and low latitudes of the ocean. In turn, a weakening of the transport of cold deep water is caused by a rise in water temperature at high latitudes of the ocean, and this rise is caused by the local decrease in the heat transfer from the ocean into the atmosphere. In the case of the land-covered Earth, the most remarkable feature of the solution, apart from that mentioned above, is a considerable strengthening of the meridional transport of sensible and latent heat in the atmosphere. This feature is explained, first, by the concentration of the meridional heat transport within the atmosphere (in two other cases examined it is redistributed between the ocean and the atmosphere) and, second, by the intensification of disturbances of synoptic scale in the atmosphere determined by an increase in temperature contrast between the northern and southern atmospheric boxes. Figure 6.1 Seasonal oscillations of average (over the Northern Hemisphere) climatic characteristics for the present-day ocean-land area ratio (1), and for the ocean-covered (2) or ocean-free Earth (3), according to Kagan et al. 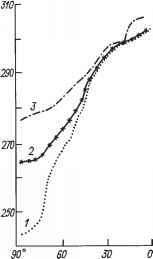 (1990): (a) the mass-weighted average air temperature; (b) the mass-weighted average air specific humidity; (c) the surface air temperature; (d) precipitation. surface air temperature in the case of the land-covered Earth is higher by 5 or 6 K than for the other two cases. If we now consider that the air humidity and temperature are related to each other by a non-linear dependence then the above-mentioned increase in atmospheric moisture content becomes clear. But then the climate of temperate and low latitudes in the case of the land-covered Earth has to be more humid than the climate complying with present-day distribution of land and ocean. This result, a contradiction of common sense, is a consequence of fixing of soil moisture content. It serves as direct evidence in favour of the importance of a proper description of the hydrological cycle when modelling the paleoclimate. Figure 6.2 The meridional distribution of the annual mean zonally averaged temperature of the underlying surface, according to Barron et al. (1984): (1) the case for polar continents with snow cover in high latitudes of land; (2) the same but without the land snow cover; (3) the case for the equatorial continent. that it represents the ocean in the form of a 'swamp' with zero heat capacity. The derived dependence on latitude of the annual mean zonally averaged temperature of the underlying surface is shown in Figure 6.2. As can be seen, in the case of the equatorial continent the annual mean zonally averaged temperature of the underlying surface in a region of the pole remains higher than the water freezing temperature; meanwhile in the case of the polar continents it decreases (compared with the previous case) by 12 K if the existence of snow cover at high latitudes is not taken into account, and by 34 K if it is taken into account. These estimations point to the fact that the maintenance of low temperatures of the underlying surface and, hence, ice and snow in polar latitudes, is determined exclusively by nature or, more precisely, by the reflectance of the underlying surface. Another explanation is the temperature decrease in the equatorial and tropical latitudes where it is connected with the enhancement of evaporation when land is replaced by ocean. For the Earth as a whole the annual mean temperature of the underlying surface in the case of the polar continents turns out to be lower by 4.6 K than in the case of the equatorial continent when the ice cover of land is not taken into account, and by 7.4 K when it is taken into account. Thus it is obvious that the climate is quite sensitive to variations of the mutual locations and to the ratio between the ocean and land areas. Let us direct our attention to one more circumstance. What is in question here is the dependence of climate sensitivity to variations of one climate-forming factor on a change in another, that is, what has come to be called the sensitivity of sensitivity (or cross-sensitivity) of climate, which we will come across in the next section in the discussion of climate sensitivity to variations of atmospheric C02 concentration with and without consideration of the meridional heat transport in the ocean. The same situation arises here. Indeed, it is clear from general reasoning that climate sensitivity to variations in the solar constant or in the concentration of atmospheric C02 must be larger if the continents are grouped in the vicinity of the pole, and less if they are in the region of the equator. The cause of this is an enhancement of the positive feedback between albedo and temperature of the underlying surface due to the appearance of sea ice and snow cover of land in the first case, and their absence in the second case. This is confirmed by estimates of climate sensitivity to variations in the solar constant for Late Paleozoic and Late Mesozoic paleogeographical reconstructions of the Earth's surface (see Verbitskii and Chalikov, 1986). From this it follows that the transfer of respective paleoclimatic estimates from one geological epoch to another should be done with caution.